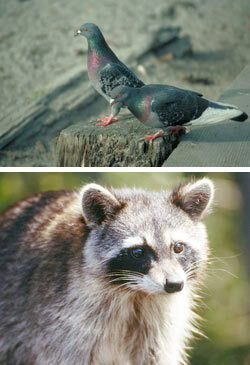 Wildlife has been known to carry and transmit the Rabies virus. Below are other diseases associated with Wildlife Species. Histoplasmosis - histoplasmosis is a disease caused by a fungus, (Histoplasmosis Capsulatum). Both humans and animals can be infected. The disease is transmitted to humans by airborne fungus spores. The area under a roost usually has to be enriched by droppings 2 years or more for the organism to reach significant levels. This fungus has been found in droppings such as in an attic area. Baylisascaris Procyonis - (Raccoon Roundworm). Unlike many animals raccoons tend to defecate in one certain area creating a toilet. House cats have similar habits. A search of your roof line, behind wood piles or in an attic area, may reveal the presence of raccoon droppings/ The raccoon would have to be living in your home for some time to develop a pile like this. Be careful around these droppings as they may contain Roundworm knowns as Baylisascaris Procyonis. Animal Control Services of C.N.Y.